This fresh and colorful salad is the perfect side dish or main dish this summer. My husband declared this the best salad he’s ever eaten. It was tangy and sweet, crunchy and delicious! I hope you enjoy this one! 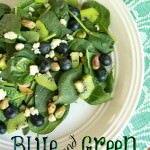 In a large salad bowl, toss together spinach, blueberries, kiwifruits, pistachios and blue cheese. Divide salad onto plates and top with raspberry vinaigrette.